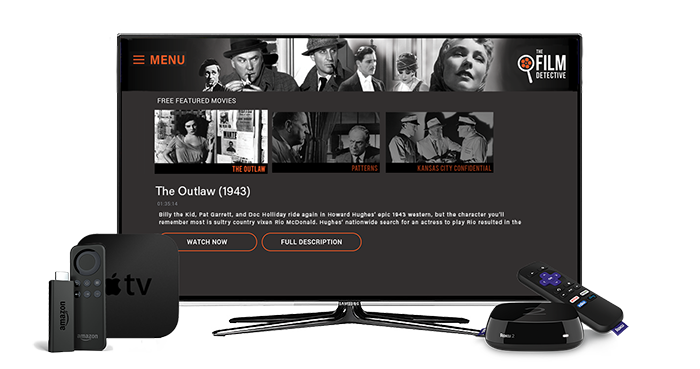 You can now enjoy our great selection of classic movies and television shows through web, iOS, Amazon Fire TV, Apple TV, and Roku! To begin watching our monthly selection of movies on your app, simply search for “The Film Detective” in the respective app store. After downloading and opening our app, you will be able to view our active library for free, with ads. If you prefer to watch your shows ad free, you may create an universal subscription here. This subscription will allow you to watch our content ad free across all of our streaming apps. For help on downloading our app to your specific device, please click on one of our guides below. If you would like to watch our movies online, please click here.